An Automated Storage and Retrieval System or AS/RS is a system whose operations have been optimized thanks to the installation of machinery and automated systems, which run operations related to the receipt of goods, their storage, picking and dispatch. These systems can come in very different forms and with very different functions, since there are distinct levels of warehouse automation. The role logistics software plays cannot be left on the sidelines when exploring what automated warehousing means, as it forms a vital part of automated logistics activities. 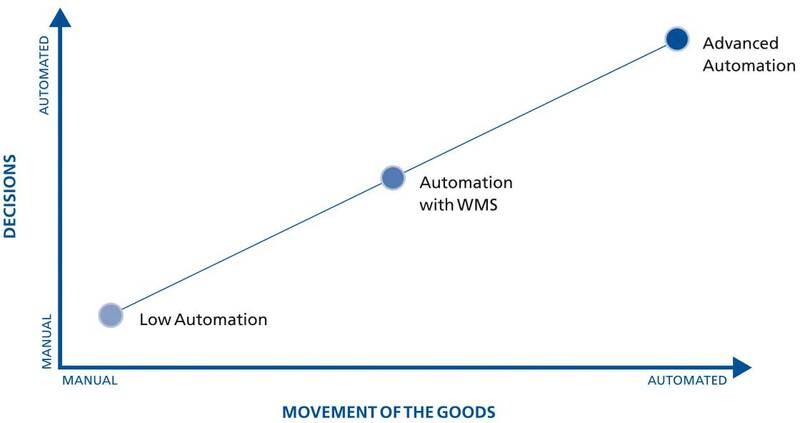 The machines function thanks to computerized control and execution systems, which connect the machinery’s capacity to the unique functionalities of WMS warehouse management systems. So, why automate a warehouse? An increase in space and personnel costs due to high demand logistics. A surge in the frequency and complexity of order fulfillment management. Changes in consumer expectations, who demand faster delivery times, customized orders and are hyper-sensitive to mistakes (above all due to the proliferation of e-commerce in warehousing). Thus, it’s not by chance that sales of industrial robots increased by 30 % in 2017, according to the IFR International Federation of Robotics. A boost in storage space and capacity. Better overall workplace health and safety. The above factors lead to savings in operational costs and an increase in global productivity of in-warehouse activities. Busting warehouse myths: What is and isn’t warehouse automation? An inflexible strategy that will put a stranglehold on my logistics operations, with no way back: if an in-depth analysis is done beforehand, this sidesteps a risk of this type. Automated systems are very expensive and out of my investment scope in terms of ROI: using these systems have a direct impact on an installation’s profitability. These rigid solutions are out of touch with my core business activities: given the advances in technology in this field, a broad range of solutions are available on the market for all sorts of sectors and warehouses. Two main areas can be automated: decision making (task allocation to the different operators, which pick routes to follow, etc.) and the shifting of goods between warehouse zones. Both form part of defining an automated warehouse, since it result in the combination of the mechanized automated system and the use of warehouse management systems. Things are still run through traditional paper work to carry out and register day-to-day operations. In general, these warehouses depend in large part on printed order forms and on-the-go decision making by operators. These team members decide how to go around your facility and spend a lot of their time picking products from the racks and moving from place to place. Operations get more complex the bigger the warehouse. That is why many companies have opted to automate all their management processes. Here is where a WMS comes in: decision making is delegated to an automated system that tells each person involved in processes what they must keep doing. Normally, commissioning a WMS involves moving towards using automated systems that assist task performance, such as radiofrequency scanners or other picking systems like voice-picking or pick-to-light. This is what defines excellence in automated warehousing. It deals with installations that, for example, have delegated the transport and storage of their goods to high-tech handling systems. The majority follow the goods-to-person picking model: stacker cranes, chain or roller conveyors, miniload systems for boxes or totes or Pallet Shuttles. At the core of what defines an AS/RS lays the search for more efficiency in storage facilities of all kinds. That’s why the trend toward automating logistics operations in warehouses is gaining ground worldwide.